The rest of the donkey herd? Here. Hi, I just love reading your post and blog!! Very inspirational to me. I'm curious about your photo taking. I too have a farm of sorts, mostly ponies and ducks, chickens etc but I see so many photo opportunities during the day and always think about taking a pix. I bought a little inexpensive Nikon hoping that I could keep it in my pocket. What type of camera do you use? Your photos are wonderful but since I am constantly in water, dust, manure and general dirt how do you carry a camera around and how?? So glad you're enjoying my blog. As for my camera, I'm a point and shoot kind of girl and for the last couple of years have been using my third Canon PowerShot - it's this G11 model. I love it. I shoot almost all my photos on the AUTO mode. There's a newer G12 model available that costs a lot less. Thank you very much for responding! I'm going to try carrying it around again in a case this time and see what happens! I see so many cool things too being outside most of the day that I am always saying I should have a camera.Thanks!! Dan looks great! 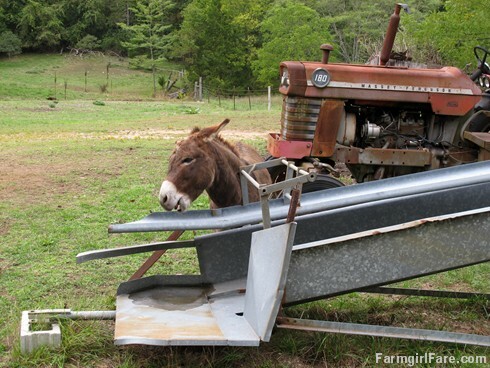 I miss the daily donkey but can understand how tough that had to be to keep up with. I am glad to see he survived the operation. Does it make him less "interested" in the girls? Does he still attempt to mount them? or do they all live peaceably together? 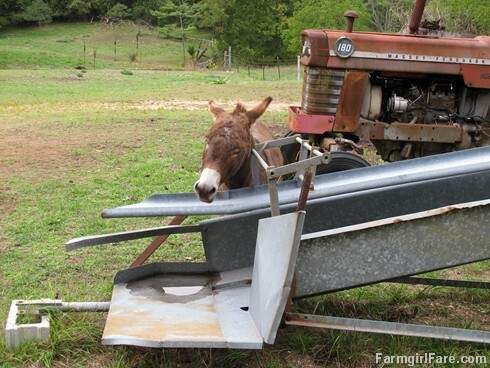 It sure looks a little greener there and I see a puddle on that piece of equipment---any chance you will get some hay? I grow and love the white cukes too. Let us know if they make it! I owe you an email - or two! 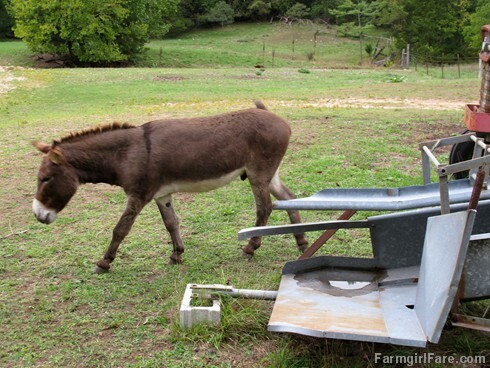 I, too, miss The Daily Donkey. I had to put it on hold because the donkeys started getting tired of being photographed so much (okay, and it might have been partly me), but I've been stockpiling pictures of them (and a few are even of them not eating treats!) so maybe we'll go back to it. It's so hard for me to keep to any schedule (anybody notice the Friday Farm Fix has been missing lately? ;) but it was definitely a popular feature. All the boys are definitely much less interested in the girls. I haven't seen anybody mount them in quite a while. The best part, though, is that the boys have stopped fighting. It took a little while, but they seem to have settled down and figured out a hierarchy. Before we got them fixed Dan and Gus were really tearing each other apart. It was awful. Happy to hear about peace in Donkeyland and everything else you share. Lookin good, Dan, lookin good!